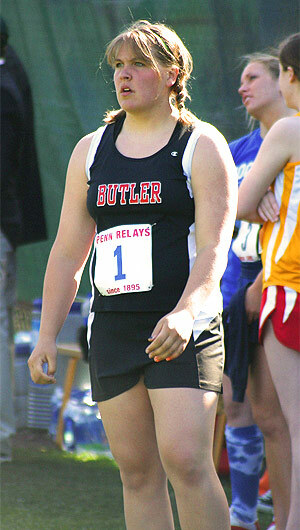 Butler NC senior Aslynn Halvorson has had some impressive victories in her distinguished high school throwing career, including state titles, national age group championships and a 2008 Nike Outdoor national discus title, but one of her biggest wins came two weeks ago in the Penn Relays discus ring. There, Halvorson set a meet record and established a new PR of 161-08 which currently has her sitting US#5 on the national list. 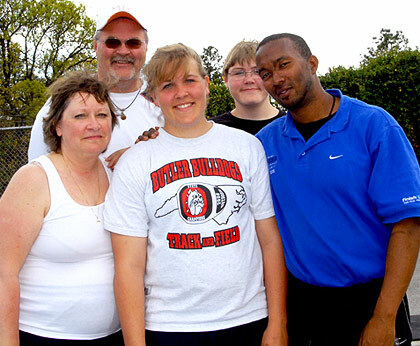 A multi-faceted thrower, Halvorson has shone in the shot put and weight throw indoors (she was 4th in both at the 2009 Nike Indoor Nationals), and adds the hammer and discus when the throwing moves outdoors. It's been a great spring for Halvorson with the platter, as she's reeled off multiple wins inside North Carolina and added that Penn victory to a Taco Bell title she notched in an early April trip to South Carolina. With NON and USATF Junior Nationals on separate weekends this year, there will be ample opportunity for the Tennessee-bound senior to test herself in the summer against the best female throwers in the country. DyeStat senior editor Dave Devine hangs around the throwing cage for a few thoughts from this North Carolina standout. 1) You're once again near the top of the national lists in the girls' throws, with that great Penn Relays discus meet record and PR of 161-08 a recent highlight. Can you talk about your senior year so far-- how things are progressing with your season and what you perceive as your best performance at this point in the year? My outdoor season is progressing much better than my indoor season for sure. During indoor, I suffered a shoulder injury that held me back in some of my training and performances, but now that it is all healed, I feel I can really perform to my full potential. In discus, my best performance to date was at the Penn Relays, which was an amazing experience to perform at such a high level in such a prestigious meet. Shot put-wise, I don't feel I've had a meet where I've really gone my full potential. There are still a lot of kinks to work out, but I'm sure it will come together when the time is right. 2) You did a good amount of traveling during the indoor season, hitting the Simplot Games in Idaho and the Nike Indoor Nationals in Boston, among other meets. At a lot of those competitions, especially in the weight throw, it often seemed like it was you against the entire Throw1Deep club from Georgia. Is it intimidating to go against such a deep squad? Have you gotten to know those girls at all, and do you learn some things as you watch them compete? I've never really thought about it as going against an entire squad before. Some of the members, like Lauren Chambers, I've been competing against since I was thirteen. When I look at it as competing against individuals I've known since I was young, it doesn't really seem that intimidating. That lack of intimidation doesn't dilute the team's talent though. When they show up at a meet, I always know there is going to be good competition, and big throws all around. 3) In a number of photos from various meets you are squinting and "sighting" along your extended right arm before you throw, which reminds me of Becky O'Brien last year and Kamorean Hayes before her. Is that something you picked up from one of those girls, or just developed on your own? As a competitor, what's the purpose of that move? Does it help you focus? Get a sense of the angle you're hoping to hit upon release? Let everyone watching know exactly where you plan to throw the disc? When I was younger, a lot of my competitors would poke fun at me for pointing and call me Babe Ruth, because they thought that I was pointing where I was going to throw it, even though at the time I wasn't all that great of a thrower. That's really not the case. The point was something I picked up from my coach, Shelton Harrison, and is something all the athletes he works with do. The point in reality is a prayer. Every time I step in the circle, I point to say a prayer, to thank God for that moment, that throw, and to ask help, because knowing me, I need a lot of it. The point also acts as a focus point. When coming out of the back of the circle, Coach Harrison has taught us that we need to fix our eyes on that point before we move forward, in order to maintain our balance and channel momentum forward. 4) You've been on the scene for a number of years now, excelling in both shot and discus, and the weight throw indoors. How do you balance your preparation and training between those disciplines, and is there one implement you prefer more than the others? If you could focus solely on one throwing event, which would it be? I most definitely prefer discus, but hammer is growing on me. All of my training regimen is planned carefully by Coach Harrison, with the intent of peaking me at certain times in specific events at specific times. That plan determines what I happen to throw at practice one day, how much I lift the next, and so on. 5) If you were coaching yourself, what things would you identify as your strengths as a thrower, and what elements are still "works in progress"? I hope I don't have to coach myself; that would end badly. But, I feel some of my strengths would be my height for leverage, and my strength for whip. I'm quick for my size, but I'm certainly not a Wayne Davis. I'd like to improve my speed, and hopefully improve my flexibility, from the flexibility of a 2 x 4 to something a little more malleable. Also, technique is always something an athlete wants to improve upon, and I'm no different. 6) Last year you won the Nike Outdoor Nationals discus. I know you've won other national titles in age-group Junior Olympics, but would you say that NON win was your biggest victory to date? How did it feel when you realized you were going to be on the top of that award podium? Nike and Penn Relays are definitely my most exciting victories to date, with both involving comeback throws that happened to be a gift from God. However, I feel that my most memorable victory was when my high school's women's track team won the North Carolina 4A Outdoor State Championship last year. I personally did not throw my greatest at that meet, but my team, out of nowhere and unexpectedly, won. It was an awesome experience. At Nike on the podium, I was so caught up in the moment that I forgot to take off my sunglasses and I think I called someone by the wrong name a couple of times. I didn't really realize what I had done, or really what was going on. I just know that on the podium it was big and bright, they told me to smile, and I felt really humbled. 7) The discus, which would seem to be the better of your two throwing events outdoors, is crazy this year. At DyeStat we've been talking about how the success of athletes in the throws in general-- boys and girls -- might brand this the Year of the Thrower. Finley...Jelmini...Vena...Shirk... McCullough...it seems like throwers are stepping up huge in 2009. Does it feel that way to you? Are you someone who follows the national scene fairly closely, and if so, who are you most impressed with so far this year? I don't really follow the national scene all that much, and I'm not even sure where I'm ranked, but I have seen some huge throws this year. I had the privilege of watching Conor McCullough throw the weight at Nike Nationals and was completely awe-struck. I've also competed against Anna Jelmini at the Simplot Games, and I got to watch Justin Shirk throw javelin in Puerto Rico. I'm really impressed with all of the big performances that throwers are having this year. Not to short the runners, but I'm really happy that the throws are getting some attention for once, since they are usually forgotten about in the big track and field roster where the sprints and jumps seem to hold the public's attention. 8) Next year you're heading to one of the best track programs in the country, becoming a Tennessee Volunteer. Can you discuss how the recruiting process was for you, what other schools you may have considered, and what in particular drew you to Tennessee? Were you watching the Volunteers win all those relay titles at Penn this year? To be honest, I didn't watch any of the Penn Relays. The night before I competed, I was supposed to get into Philadelphia at 11 PM on Thursday. However, the weather had other plans, delaying my arrival to 4 am on Friday. From there I had to be at the track at 7 am for discus warm-ups. With only two hours of sleep, I crashed after the competition was complete. The recruiting process for me was complicated. When I first started, I really had no idea what I was looking for, or what I should expect. After a long and grueling process, I took official visits to LSU, Alabama, University of Georgia, and Georgia Tech. There were many things I liked at all these schools, and my decision was growing ever more complicated. I then drove up to UT for an unofficial visit to get a feel for what it was like and to observe a practice. To my surprise, I found a lot of the qualities I was looking for in a college, such as location, coaching, and academics, all close to home and near extended family. Another bonus was the configuration of a split squad, with separate men's and women's programs, which allows for individualized attention as well as UT's support for women's athletics. Coach Frazier has a history of great throwers, and I'm confident and looking forward to be a part of the team and their tradition of producing champions.